A Jobs sign is seen on the U.S. Chamber of Commerce building in Washington in 2013. 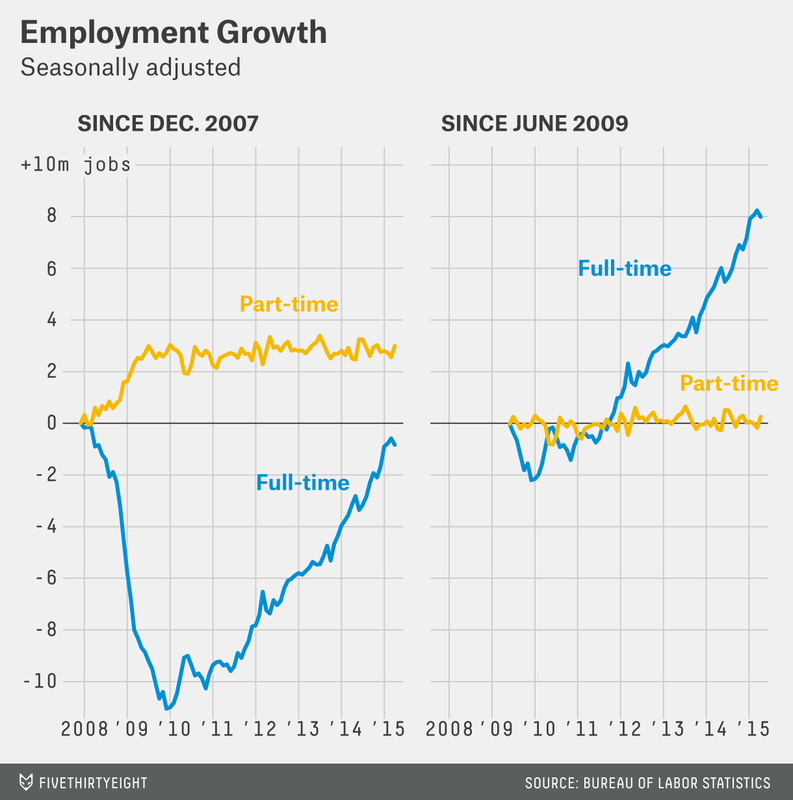 The jobs recovery was what we thought it was. After last month’s lousy numbers, that’s reason enough for celebration. The U.S. economy added 223,000 jobs in April, and the unemployment rate fell to 5.4 percent, its lowest level in nearly seven years, the Bureau of Labor Statistics said Friday. That’s a solid month for the job market, but unspectacular by recent standards – pretty much a continuation of recent trends. But in this case, “a continuation of recent trends” sounds pretty good. That’s because last month’s jobs report showed a worrisome break from that trend: a sharp slowdown in hiring. That slowdown turns out to have been even worse than initially believed: Employers added just 85,000 jobs in March, 41,000 fewer than first reported. March now stands as the worst month for job growth since the middle of 2012. The stronger April figures suggest that March was, as many suspected at the time, just a blip. Job growth has topped 200,000 jobs in 13 of the past 14 months, and while that doesn’t sound as good as “14 months in a row,” one month of weak numbers doesn’t change more than a year of strong ones. All the caveats that applied to last month’s numbers apply to this one’s too, of course: The figures are preliminary, subject to revision and are volatile from month to month. But the most reasonable interpretation of the evidence is that the job market remains on the same track that it’s been on for much of the past couple years, neither as strong as November and December’s blockbuster numbers nor as weak as March’s bad ones. So where does that leave us? The good news is that the job market remains resilient despite weak growth overseas and signs of a slowing economy at home. In the early stages of the recovery, hiring seemed to screech to a halt every time the economy hit a speed bump; these days, employers only ease off the accelerator. On the other hand, April’s numbers did nothing to ease lingering concerns that the headline jobs numbers are masking deeper problems in the economy. People who abandoned the labor force during the recession still aren’t returning to look for work. Wage growth still isn’t accelerating. 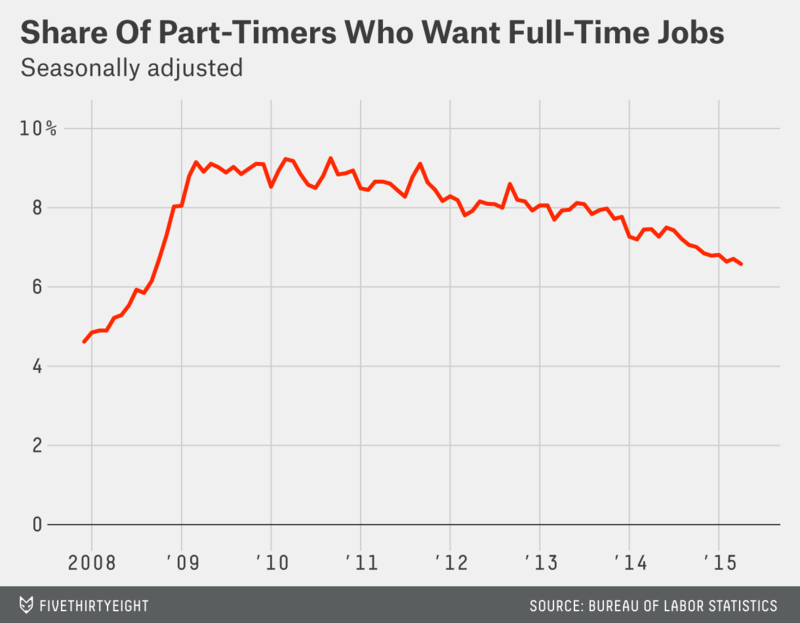 Millions of Americans remain stuck in part-time and low-paying jobs. Friday’s report helped ease the short-term fear of a hiring slowdown, but the long-term troubles remain. Wage growth remains weak: Quarterly numbers released by the government last week hinted that employers might finally be raising workers’ pay. But there wasn’t much evidence of that in Friday’s monthly figures. 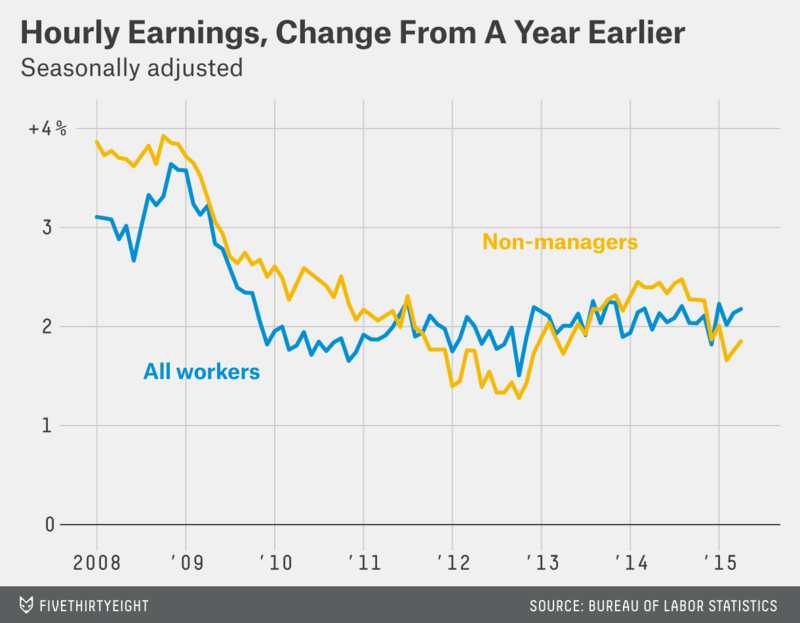 Average earnings rose 3 cents to $24.87 an hour, up 2.2 percent over the past year. For non-managers, earnings are rising even more slowly. Meanwhile, the average workweek stayed flat at 34.5 hours, and manufacturers actually cut overtime hours; both numbers suggest companies aren’t struggling to find workers, which may make them less likely to raise pay. Unemployment down: Regular readers know that the unemployment rate only counts people who are actively looking for work, which means it can fall for good reasons (more people find jobs) or bad ones (more people give up). 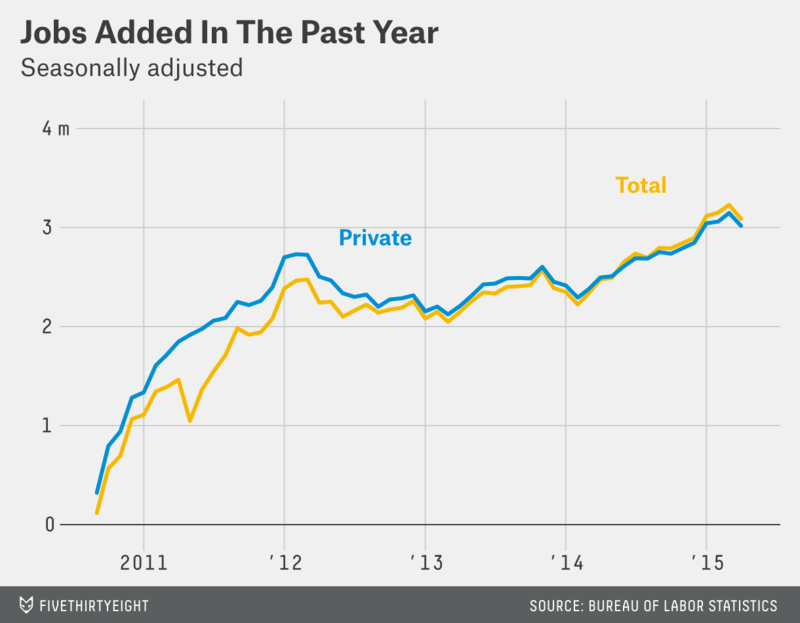 In April, the news was good: More workers found jobs and fewer lost them. The unemployment rate has fallen 2.2 percentage points in the past two years, the fastest drop since the mid-1980s; at 5.4 percent, the rate is now in a range most economists consider consistent with a strong economy. 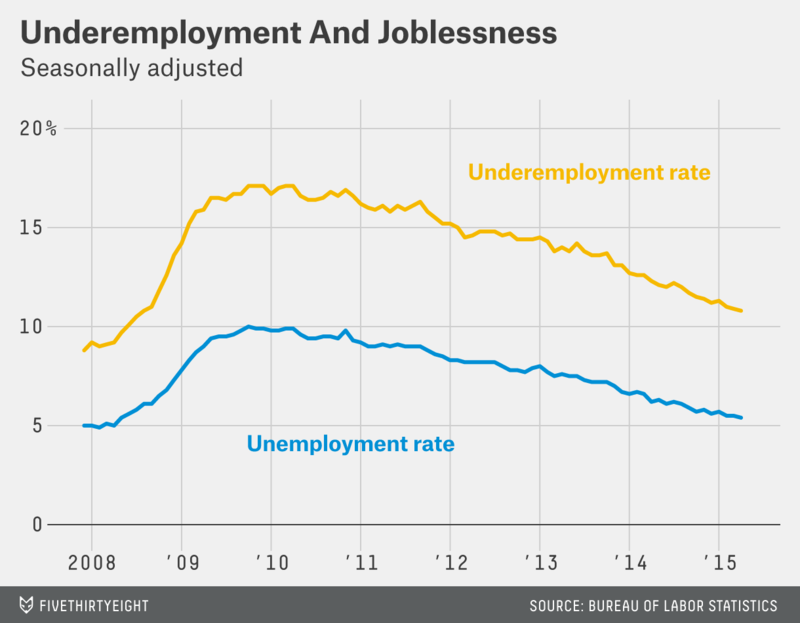 Still, the unemployment rate may overstate the health of the job market. A broader measure of un- and underemployment, which counts people who have given up looking for work or who are stuck in part-time jobs, is exactly double the headline unemployment rate, at 10.8 percent. The broader measure is falling too, but it remains well above its prerecession level. And while Friday’s report showed an uptick in the participation rate – the share of the population that has a job or is actively looking for one – there has been little sign of a surge in people returning to the job market to look for work. Fewer working part-time involuntarily: Nearly 6.6 million Americans are working part-time because they can’t find full-time jobs. That’s down nearly a million from a year ago, but remains far above normal levels; when the recession began, just 4.6 million workers were stuck in part-time jobs. The bigger picture is more mixed. The vast majority of the job growth in the recovery has been in full-time employment: Since the recession ended in June 2009, the economy has added 8 million full-time workers while part-time employment has been more or less flat. But despite nearly six years of economic growth, full-time employment still hasn’t returned to its pre-recession level. Layoffs hit the oil patch: The mining sector – which is dominated by the oil and gas industry – cut nearly 15,000 jobs in April, and has shed nearly 50,000 jobs so far this year as companies have cut back drilling in response to low oil prices. The layoffs are hitting certain parts of the country especially hard: Texas lost more than 25,000 jobs in March, and far smaller North Dakota lost 3,000. (Those figures cover all industries, not just oil and gas.) Meanwhile, the strong dollar may be hurting U.S. manufacturers: Factory employment was more or less flat for the third consecutive month. With oil and manufacturing both suffering, much of April’s job growth came in lower-paying sectors such as retail and hospitality. Restaurants and bars alone accounted for 26,000 new jobs, although that may have been partly a rebound from weak numbers in March. Temp jobs, meanwhile, posted a second straight month of solid growth following two months of unexpected weakness.